This award winning pub has a real community feel to it. Fine ales and great food. The web site is simply constructed and is easy to navigate. Local images and community news together with all of the pub information that a visitor could want. A new all female company providing cleaning, gardening and decorating services in Lutterworth and the local villages. The team built the site themselves, G2web provided some search engine support and keyword SEO advice. A specialist firm dealing with agricultural silos and slurry storage units, Hibberds wanted a web site that highlighted their skills, and that was easily found by search engines. 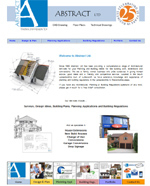 Providing building and planning services the remit was for a colourful and easily navigated site. Simple but effective. Strong images tell a clear story. A business site for IT services that has a simple and spacious layout so that the text can become the focus for the reader. Daniel is a Independent Film Maker and Visual Artist. Daniel wanted a site that had a lot of visual activity, with links to videos of his work and to his blog. - Daniel has now taken control of his own website. Having been let down by a previous web design firm, the Cavalier Management wanted a web site that provided information and help for new customers, but also had something for the regulars. A new business start-up in Lutterworth offering a full range of Dog Grooming services. The remit was a simple site that presented the services clearly, with room for growth as the business expands. A new company that provides quality branded clothing to companies and organisations, Route53 wanted a site that would be simple to use, yet provide dynamic use of images to display the products effectively. As a photographer, Cynthea wanted an artistic, contemporary site to display her amazing photographs. Simple white text on black highlights the vibrant colours in her images. - Cynthia has now taken control of her own website.